26 years, 500 wins, five NCAA Tournament appearances. It’s safe to say Larry Eustachy – the former National Coach of the Year – has seen it all when it comes to college basketball players. That’s why what Eustachy said about his redshirt senior guard Gian Clavell Tuesday night was so special. 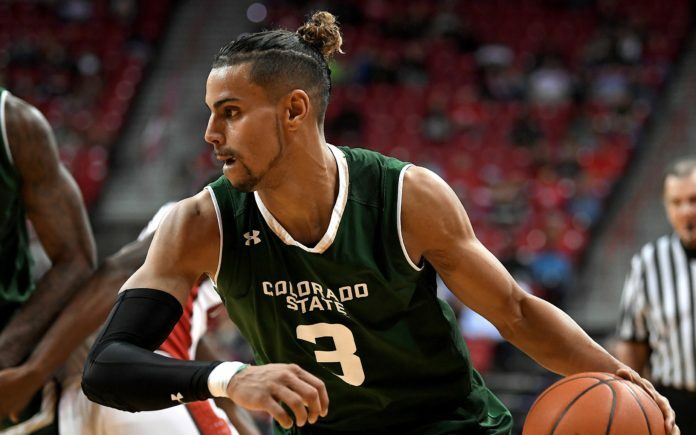 Clavell, who was Mountain West Player of the Week two weeks ago, took over the game Tuesday night, to cement CSU’s 69-52 victory over the Utah State Aggies. After his teammates had already impacted the game to push the Rams into the lead – Emmanuel Omogbo recorded his 14th double-double and Nico Carvacho was the game’s leading scorer with 11 points – Clavell put his stamp on the victory. 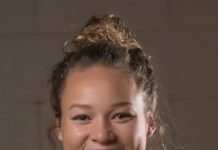 The Rams guard was lethal from deep, hitting a long two before sinking four straight 3-pointers in a 14-point blitz, which buried the Aggies. 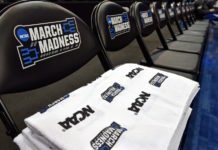 One of the 3s was unthinkable, a dancing, spinning jumper which floated into the hoop, as Clavell finished with 24 points, far and away the game’s leading scorer. In the contest, Clavell also led the team with 39 minutes on the floor, a load he’s had to burden due to the fact his Colorado State squad has been limited to a rotation of seven players. The redshirt senior has reiterated multiple times they won’t get tired due to the intense, run-heavy workouts Eustachy and the coaching staff puts them through in the lead-up to the season, but even Clavell had to admit he was a little physically fatigued at the end of the Tuesday’s game. Physically fatigued, yet mentally strong enough to push through and score 14 straight points, putting away a pesky Utah State team which threatened to push the game in Logan, Utah into overtime only a few weeks ago. Of course, scoring is fun and exciting, but executing on the defensive end is what matters most to Eustachy. Omogbo fiercely defends the opposing team’s best forward, Clavell, the opponent’s best guard, while they find a way to fill up the stat line on the other side of the court, as well. With a mere seven players – The Magnificent 7, as they’ve been dubbed by Tony Frank – Clavell and Omogbo simply have to ball out every night. Omogbo 10.9 boards per game is the best in the Mountain West. Meanwhile, Clavell’s 18.6 points per game would be fourth-best in the MW, but he missed nine games at the beginning of the season due to being suspended surrounding charges of false imprisonment, which were dropped in late January. Before this season tipped off, in an exclusive interview, Clavell told Mile High Sports Magazine it was really difficult for him to sit out, last season, due to injuries. He wanted to play with his seniors Dantiel Daniels, Antwan Scott, Joe De Ciman and Fred Richardson. And going back to last summer, he was arrested – those charges also dropped – before playing nine games and then electing to have his shoulder surgically repaired. It’s been a long, up and down road for Clavell at Colorado State. But, now healthy, more mature and a more well-rounded player than ever, he’s shining as the Rams’ best player and one of the top in the Mountain West. In fact, Clavell and Omogbo are the two best players in the conference. Together, the embattled seniors have led their Rams to five wins in the last six games and a 16-9 overall record. At 8-4 in the Mountain West, Colorado State is only a half game back of the lead, behind Nevada and Boise State. With their two seniors leading the way, CSU has a chance to make some noise in the Mountain West tournament in one month. Three wins there, in three nights, and the Rams would make the NCAA Tournament for the third time in Eustachy’s five years in Fort Collins. That’s a tough task, and just finishing out the back-loaded regular season will be tough, too. Saturday, the Rams host Fresno State (2 p.m. MT tip) then play at Wyoming on Valentine’s Day, play at New Mexico in The Pit, host San Diego State and Wyoming before playing conference leader Nevada in Reno in the regular season finale. Rams fans, though, are certain anything is possible with Clavell in the lineup. In 2000, when his Iowa State Cyclones lost in the Elite Eight to the eventual champion Michigan State Spartans, Larry Eustachy had Jamaal Tinsley, the Big 12 Player of the Year, on his team. After being named an All-American in 2001, Tinsley went on to play for 13 years in the NBA. So, for Eustachy to call Clavell the second-best guard to Tinsley is a massive compliment, and for Clavell to play so well under the hard-nosed coach is special, too. The Puerto Rico native told MHS before the season he respects Eustachy and his “tough love” approach because, “He’s a winner.